The Royals are 60-60: So you’re telling me there’s a chance? This is the second year in a row I’ve done absolutely no blogging in June or July. When the Kentucky Derby ends, this site just sits idle until mid-August when the postseason race heats up. Not by choice, necessarily. It’s a time commitment thing. Summer is busy. August, on the other hand, is not. I want to talk about two different things today. First, a quick look at how we got here. Second, stew a bit about what we’re rooting for the rest of the way. How did we get here…what went wrong? Nearly everything has gone wrong that could’ve gone wrong. Looking at pitching first: Luke Hochevar is done for the season. Offseason addition, Joakim Soria, has been mostly terrible in his Royals return. Kris Medlen is done for the season. Wade Davis is on the DL. Chris Young spent time on the DL and was atrocious in the rotation. Hopeful September call up, Kyle Zimmer, is done for the year (again). Mike Minor has had setbacks on his return. It’s a mess, really. On the offensive side of the game: Mike Moustakas is out for the season with an ACL injury. Alex Gordon missed some time on the DL too, but even when he was healthy he’s been terrible. Gordon’s batting average was below .200 as late as August 9, yet somehow Eric Hosmer has been even worse since winning All Star Game MVP. Lorenzo Cain spent time on the DL. If you’d told me all those things at the start of the season, I’d tell you we’d only win 70 games. How did we get here…what went right? Yet somehow this team is 60-60 with 42 games left. They sit 9.0 games out of the Central behind Cleveland and Detroit and 6.5 games out of the Wild Card behind a half dozen different teams. And therein lies the biggest problem – no matter what the Royals do down the stretch, there are enough teams ahead of them it’s still extremely unlikely they’ll break into the postseason. But we’ll get there in a second. Danny Duffy is 10-1 with a 2.73 ERA and is in the AL Cy Young conversation. Yordano Ventura has taken another step. Ian Kennedy – despite leading the majors in home runs – has been more than adequate. Kelvin Herrera has been his normal dominant self and if Matt Strahm has been equally solid since being called up this past month. #VoteOmar has been cut and replaced by #2HitWhit and #RAM. If you told me all that stuff back in April, I’d’ve thought we’d been pace to win 95 games. So when you think about it, of course they’re .500. They’ve balanced the good and the bad, injures with unexpected success stories. All in all, it’s been a very polarized season, but over the course of a long long baseball season, extreme good and extreme bad have a way of averaging out to .500. On July 31, the Royals were 49-55 and 12 games back in the division. On August 9 they were 6 games under .500. Since then they’ve gone 7-1 and if they haven’t resurrected their season yet, they’re at least resurrected a blog post like this one. Sure, suddenly this team is .500 again, but .500 teams don’t play in the postseason. So the Royals will have to finish very strong to defend the crown in 2016. And some other things probably need to tip their way too. For the sake of time and energy let’s say the Royals finish something like 27-15. They’ve got 10 games left against the Twins and 7 against the White Sox, so that number is certainly possible. And with the exception of next week’s road trip to Miami and Boston, the remainder of the schedule is either at home, or on the road vs AL Central opponents. That finish would put KC at 87 wins, which is right on the bubble of being a Wild Card team. The issue here is not the record – 6.5 games back with 42 to play is absolutely doable. If it was about the record, I’d just end this post now by saying, “The Royals need to win 27 or more games before they lose more than 15” and wrap it up. Cause that would do it, it it was just us vs another team. The issue, as I said at the top of this post, is the number of teams the Royals are chasing. The Royals need to pass FIVE different teams to land the final Wild Card spot currently held by Baltimore. The Red Sox and Mariners are hot. The Tigers and Astros are not. Baltimore and Yankees are somewhere in between. Additionally, the Red Sox are only 1 game behind the Blue Jays in the AL East, so Toronto is actually in the mix as well. Boston, Baltimore and Toronto: The first thing that must happen is at least one of these teams needs to have a bit of a free fall. The Orioles are the most obvious option as they’re in 3rd, but I sure do hate Toronto. The Red Sox are rolling, it’s tough to think thy’ll let off the gas. Which leads to the second thing that needs to happen: The other two teams need to stay hot. I know that sounds counterintuitive at first, but all these teams play each other multiple times over the next 6 weeks. Baltimore/Boston: 7 games left. Baltimore/Toronto: 6 games left. Boston/Toronto: 6 games left. The best way to gain ground on the final Wild Card spot is for the Sox and Jays to hand the O’s a combined 13 losses. That opens things up immediately. If those teams all split the series, then the Royals likely won’t gain enough ground to overtake any of them. Doesn’t matter which one plummets, but one of them has to. And the best thing that can happen is the other two mow down the rest of the competition around the league. Detroit: Just swept these guys, and it did wonders for our chances. We can’t waste our time worrying about what Detroit will do. We have 6 games left against them. If we take care of business against them, we can make up the ground ourselves. Assuming the Royals do their part, we control our own destiny against the Tigers to some extent. That said, they’re playing the Red Sox this weekend, and if Boston is going to be one of those teams to pull away, might as well root for the Sox this weekend. We’ll know more on these guys by Monday, but if we’re worried about the Tigers, then we’ve already lost. Yankees: What a shock to see this team in the mix. Major sellers at the trade deadline, yet due to an influx of youth, they’ve hung around are are in the mix in late August. What do we want from the Yankees? Well, we want them to follow suit based on what the other three AL East teams do. They have 9 games against the Orioles left, 7 against Toronto and 6 against the Red Sox. They need to help beat the team that fades, but lose to the two teams that pull away. But again, if we’re worried about the Yankees, then we’ve already lost. Astros and Seattle: I’ve been high on Houston from the beginning. While the White Sox were busy fooling everyone into wondering, “Is Chicago for real?” the Astros were so bad out the gate, many thought their season was over. Not me. The season is long, and good teams rise to the top and bad teams eventually drown. And here we are in mid-August and the Astros are in the mix. The Mariners, on the other hand, are on a surprising surge. They’re finally looking like the team many of us believed would be great back in 2014 and 2015. These two teams play each other 6 times down the stretch. Houston has 4 games vs Baltimore this weekend and Seattle has 3 games vs Toronto in September. Otherwise, it’s AL West matchups galore for them. We need to be huge Angels and Athletics and Rangers fans. So there’s a lot here, but again, none of it means anything if the Royals don’t finish strong themselves. The best thing you can do to make the postseason is win a lot of games. Right. And then there’s Cleveland, currently sitting at 68-50. They’re 18 games over .500 and up 9.0 games on the Royals in the division. The two teams play each other 6 times the rest of the way. If you look at it a certain way, it’s actually easier to make the playoffs by winning the division than it is by winning the Wild Card. If we continue to assume the Royals finish at least 27-15 (a big assumption, sure, but understandably necessary), and the Indians finish 19-25, then, eureka!, we’ve done it. The 2009 Twins were 7.0 back on September 7. Won the division. The 1969 Mets were 9.5 back on August 13. Won the division. The 1995 Mariners were 12.5 back on August 15. Finished 25-11. Won the division. It’s not unprecedented. Sure, it’s still unlikely, but who knows? All it takes is one bad week. Maybe next week is it? Go Blue Jays, Athletics and Rangers. We’ll see. But for now, this weekend vs Minnesota is a must win. Do another sweep, boys. 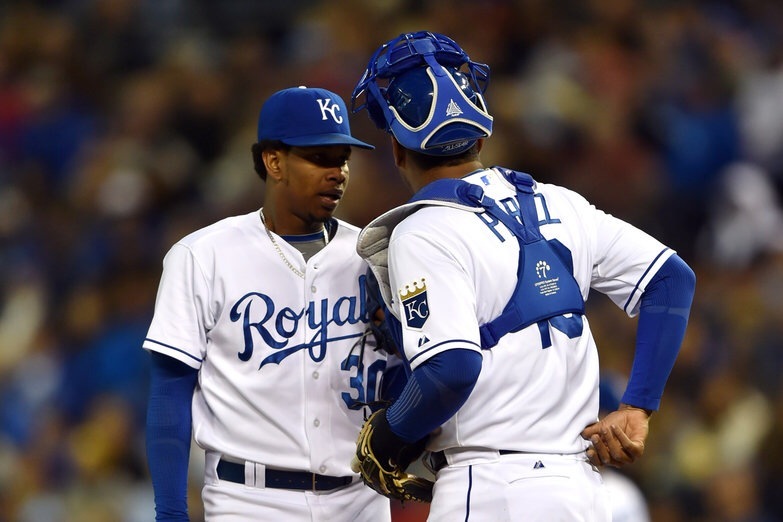 Author Adam PaulPosted on August 18, 2016 April 2, 2017 Categories Baseball, RoyalsTags AL Central, Baseball, kansas city, postseason race, Royals, wild cardLeave a comment on The Royals are 60-60: So you’re telling me there’s a chance? The Royals are 80-66. Thoughts from second place. Unfortunately, things are playing out exactly as I predicted in my worst-case scenario to make the playoffs post from last week. The Royals were 79-62, and they’ve since gone 1-4 in three games against the Tigers and two games against the Red Sox. I thought they’d take 1 of 3 in Detroit, which they did, and I was very uncomfortable entering this weekend. But I never expected them to look this bad. With the exception of James Shields’ start on Wednesday, this team seems to have lost their identity entirely. Yesterday was tough. Not only did the Royals lose, but the Tigers and Mariners both won too which toppled us out of the AL Central lead and into a tie with Seattle for the final playoff spot. And Seattle won the season series against us, so we’d have to go there to play a one game playoff to see who got to go play Oakland in the WC matchup…assuming the A’s don’t continue their own miserable collapse. All that to say, the Royals fell 0.5 game behind the Tigers yesterday (1 full game if we assume we’re going to lose the game we’re already losing 4-2 that we finish in Cleveland next week). We’re in second place for the first time in 31 days. It’s been a month since we were chasing the Tigers. We’ve caught them twice already – once in June and once in August – and we’re going to have to catch them a third time if we want to avoid the miserable One Game Wild Card Experience. Lately – actually, the entire season – I’ve found myself playing the role of a stabilizer in conversations I’ve had with other Royals fans in person and on social media. This fan base is so negative, and for good reason. We are fully prepared to have our hearts broken again. I’ve found myself being the one to say things like, “It’s a long long season, and there is so much time to improve,” and, “I still believe this team can win 85-90 games again this year,” and, “It’s amazing to think that the best is yet to come.” You can say that I’ve been overly positive to this point, and that’s possible, but ultimately my goal has been to insert reality into an emotionally scarred and emotionally driven set of fans. And those are all realistic statements, I think. But last night, for really first time this season, the reality has me very nervous. The season isn’t long anymore. There are only 16 games left and the magic number is 17. And this team will surely win 85-90 games, but will that be good enough to beat out Oakland and Seattle? And I’m suddenly uncertain as to whether the best is not yet to come. Could it’s already be behind us? So that’s where I’m coming from this morning. That said, here are a few quick thoughts on the 80-66 Kansas City Royals. The next 16 games will go 1 of 2 ways. Last night felt like one giant exhale. This team has been fighting to maintain their spot in first place and has slowly been getting tense. They don’t look comfortable. They look stiff at the plate and they’re playing uncharacteristically awful defense. After the final pitch last night, it felt like that tenseness left them. Alex Gordon looked relaxed – albeit frustrated – in his post game interview. Yost mentioned that he may need to adjust the lineup, perhaps allowing a bit of flexibility into his managing. In my mind, this team was able to exhale in a way they haven’t been able to before. They’re not holding tightly to first place anymore. They’re in a different place – specifically, second. In my mind, that exhaling has two possible outcomes over the next 16 games. That exhale may have meant they’ve given up. They fell out of first and they’re done. A couple days ago, Hosmer mentioned, “We can’t fold. We’ve come too far to fold.” Fans responded, “Well, that is exactly what a folder would say.” It’s possible that the movement from first to second place means they’ve admitted the gig is up and they’re going to fold. Or, the exhale allows them to loosen up and play the game the way they’ve played it for 146 (and a half) games to this point. Have they been too fearful of staying ahead of Detroit that they’ve been a detriment to themselves? Maybe they’ll be able to make some adjustments – mental adjustments and lineup adjustments – that can propel them forward over the last 16 (or more) games. I get the feeling that it will be the latter. The question will be whether they tighten back up again once they regain the lead and potentially make the playoffs. Don’t play like you have a lead. Play your style of baseball one game at a time. Loosen up, boys. Yost might adjust the lineup. I’m so tired of Lorenzo Cain batting at the bottom of the lineup. Sure, he’s my favorite player on this team. We should probably all know this by now. If not, there you have it. But it’s just insanity. LoCain has led the team in batting average all season. He has the second highest OPS behind Alex Gordon. On the other hand, Omar Infante is dead last among the 9 daily position players in OPS. As I posted to Twitter yesterday, why would you want a guy batting .254/.290/.344 in the 2 slot while there’s a guy batting .299/.335/.410 in the 8 slot? Beyond that, Infante will get around 100 more at bats than Cain over this whole season – why wouldn’t you want the better of the two hitters (and better base stealer) to get the most ABs? So at minimum, Lorenzo needs to move up and Infante need to move down. If it were me, I’d just swap their spots in the lineup. The other thing that I wouldn’t mind seeing is Billy Butler back at first base for a game or two. File that under “Things I Never Thought I’d Say in My Lifetime.” Some people have blasted Hosmer’s defense lately and have begged Yost to put Billy back out there because they think he’s the better defender. That’s absurd. Billy wouldn’t have made those near-diving stops that Hosmer couldn’t quite make either. I’d like to get Billy back out on defense because – as odd as it seems – something was unlocked in him when he started playing both sides of the ball. Billy Butler the First Baseman batted .284/.344/.468 between July 21 and August 31 while Hosmer was injured. Before he moved to 1B, he batted .269/.320/.348, and since Hosmer has returned, Billy has hit .059/.059/.118. Something happens in Billy Butler offensively when he enters the game on both sides of the ball. So I wonder…can we either let Hosmer DH or have him come in off the bench late in the game as a pinch hitter and for defensive purposes? Even though he jacked one last night, it’s not like he’s a must-have in the lineup at this point. Especially considering how well the Royals played without him in July/August. The * denotes a left-handed batter. It maintains the L-R-L-R lineup, and puts them in a better position overall. The question mark here is how Josh Willingham fits into the picture. If he’s healthy, which apparently he’s not 100% right now, I’d start him in the DH spot over Hosmer and maybe flip flop a couple guys to maintain the L-R-L-R. Maybe Billy jumps back to DH occasionally, but he’s proven to be a much better hitter as a first baseman. It’s complicated and layered and obviously dependent on pitching matchups and health, but I’d love to see this used as a base lineup. If there’s a brightside to the game from last night, it’s that Greg Holland threw an inning and struck out the side. His velocity was down a few MPH – hovering around 93-95 rather than 95-97 – but his slider was gorgeous. I get the vibe that the training staff didn’t want him to fully uncork his fastball. At least I hope that’s what the deal was. Regardless, it was great to see Dirty Greg in the game. Another positive development over this not-so-great stretch of games is that two of the “other” half of the bullpen – the non-Trifecta guys – have emerged as being able to hold things down in a close game: Jason Frasor and Brandon Finnegan. Finnegan has now pitched to 8 batters and has retired all of them. Three of them strikeouts. He made his debut against the Yankees in the Bronx and was stellar. Some of the names he has faced and retired: Derek Jeter, Carlos Beltran, David Ortiz, Yoenis Cespedes, Jacoby Ellsbury, Mark Texiera, and Martin Prado. Also John Ryan Murphy. (Who?) Finnegan can suddenly be a very valuable lefty in this bullpen. Jason Frasor has established himself as a better-than-Crow option. Especially with Holland’s lingering shoulder issues, moving back Kelvin Herrera and Wade Davis to the 8th and 9th innings and slotting in Frasor in the 7th feels very comfortable to me. A few weeks ago, I was getting really nervous about the rest of the bullpen. Today, not so much. Bueno is good enough. Crow is good enough. As long as we don’t see Scott Downs, I’m feeling good about things. Please, please, please, can we have some plate discipline? This team’s lack of plate discipline is infuriating. I understand that we are putting the ball in play, which is better than striking out, but the Royals are dead last in the MLB in walks and it’s not even close: 335 in 5474 plate appearances. That’s 6.1%. Compare that to the Athletics’ 9.2%. It’s just maddening how this team can’t be patient at the plate. Gordon leads the team with 58 walks, but even that is sort a skewed figure because teams are pitching around Gordon to pitch to the rest of the team. Gordon has 13 walks since August 24. Why? Because Billy Butler (or Salvy) is coming up next and he’s batting .156 over that same stretch. Why pitch to Gordon when Butler is an automatic out? Next on the list: Nori Aoki (39) and Billy (38) which ranks them 105th and 112th in the league in walks. Then Moustakas (31). The rest of the everyday players haven’t cracked 30. Which simply isn’t acceptable. Surprisingly, Salvador Perez is the worst of the bunch. He swings at everything. Everything. A few days ago, he saw 12 total pitches for the whole game. That in itself is startling. But he swung at 10 of them, and only 1 of them was a ball. But it’s a team wide issue. Last night, the Royals 1 through 6 hitters saw a total of 15 pitches between the 5th and 6th innings. Allen Webster (who? ), on his third trip through the lineup, only had to throw 15 pitches against Aoki, Infante, Gordon, Butler, Hosmer and Perez. They only saw 50 pitches between the 5th and 9th innings! That’s over half the game! Somehow, there needs to be a way for them to balance their put-the-ball-in-play-and-don’t-strikeout philosophy with a be-patient-up-there-for-a-change philosophy. They’re making it too easy on opposing pitchers, especially ones like Allen Webster who we should absolutely light up. Also, considering our bullpen advantage, wouldn’t we want to get the games to the bullpen faster for both teams? No wonder Detroit’s bullpen has found success against the Royals. We haven’t had to face them as much and when we do, they don’t have to throw as many pitches to get out of the innings. All that to say. Take some pitches. I’m looking at you, Sal. Skipping Guthrie’s next start? Yes, please. I was looking ahead at our remaining schedule last night after the game. We have one off day on September 18. Conveniently, the 19th would be Jeremy Guthrie’s next start following tonight. At this point, he is without a question our worst starter (assuming Duffy returns on Tuesday), so I propose that the Royals skip his next start and move right on to Vargas on the 19th instead. The second benefit of doing this is that it would line up Vargas and Shields to throw in a tiebreaker or Wild Card matchup if necessary. If the Royals don’t skip Guthrie, then he would be lined up for Game 163 if necessary. Which is absolutely not okay. If the royals season comes down to one game, Guthrie is not who we want on the mound. That’s all I’ve got for today. Let’s go get some runs for Guthrie tonight and turn this slump around. Author Adam PaulPosted on September 13, 2014 April 2, 2017 Categories Baseball, RoyalsTags AL Central, Baseball, guthrie, ned yost, red sox, Royals, second place, tigers, wild cardLeave a comment on The Royals are 80-66. Thoughts from second place.